Designed to provide selected beneficial microflora to the intestinal tract for the purpose of replenishing needed friendly flora to promote intestinal health. Packaged in individual sachets with a pleasant lemon taste, Fivelac fits conveniently into your active lifestyle. 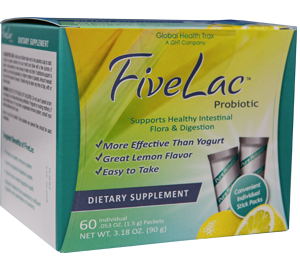 FiveLac is a powerful, enhanced probiotic formulation of five potent microflora in a lemon-powder base. 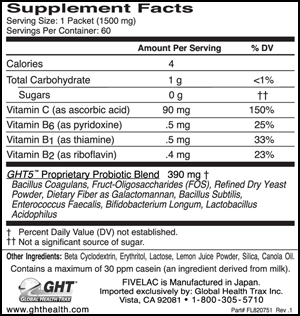 FiveLac contains the same probiotic blend as ThreeLac plus 2 additional microflora. Probiotics may be a valuable part of a healthy diet, and may play an important role in sustaining overall intestinal health. The prevalence of intestinal imbalance makes a focus on probiotics essential. Prevention of overgrowth before it occurs is clearly the better alternative. Probiotics may be a safe, cost-effective, “natural” approach that may help act as a barrier against microbial infection such as yeast overgrowth. Bacillus coagulans: A probiotic organism that may help control occasional digestion and stomach problems. Bacillus subtilis:A probiotic organism that may help crowd out “bad” flora in the intestines. Enterococcus faecalis: Enterococci constitute a major genus within the lactic acid bacteria group that exists naturally in the human digestive tract. This effective probiotic bacteria is the result of formulation under strict laboratory conditions. Lactobacillus acidophilus: These friendly bacteria inhabit the intestinal tract. The breakdown of nutrients by L. acidophilus produces lactic acid, hydrogen peroxide, and other by-products to enhance optimal intestinal flora. Bifidobacterium longum: B. longum may help keep the digestive system running smoothly.